Finding fresh fruits and vegetables in January is definitely a challenge but perhaps you are not looking in the right place. 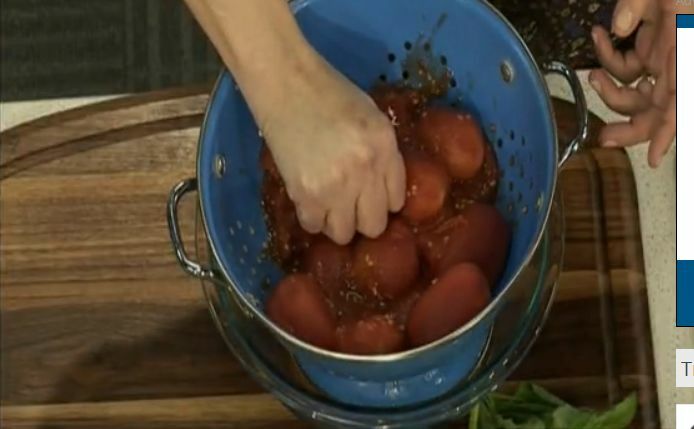 Professional chef, Amy Thielen, is host of the Food Network’s Heartland Table, amy thelen and has great tips to find great tasting family farm grown tomatoes in the middle of winter. Question: Amy, how can you find fresh farm tomoatoes in the middle of winter? Amy Thielen: Well, they’re not in your produce sections so don’t look there. I’m going to send you right down the middle aisles. Outside of summer, I don’t buy and cook with fresh tomatoes. I use canned tomatoes and I’ve tried them all, but Red Gold Tomatoes really are my favorite. They are picked at peak ripeness. They are grown under the sun. not in a greenhouse. They are canned immediately and I know they are going to have great flavor, be super tender and really bright red. When it comes to canned tomatoes, you want the deepest red you can find. In fact, the redder the tomato, the more of that antioxidant lycopene it has inside. Red Gold Tomatoes these are grown on family farms in Ohio, Michigan and Indiana in the hot Midwestern sun. They are non-GMO verified and the can is BPA free. Question: Are all canned the tomatoes the same? How can you tell they were picked at their peak of freshness? Amy Thielen: Some people say canned tomatoes are the same but they’re not. They vary in quality and all you need is a simple crush test to determine if they are picked at the peak of freshness. What I do is take my whole can (and I like to buy whole peeled tomatoes) and then I pour them into a bowl or, in this case, a colander, and I give them what I call a quick crush test. I squeeze one. and I can tell immediately if it squeezes to a pulp that the tomato was picked at teh peak ripeness and it’s going to be really, really sweet. 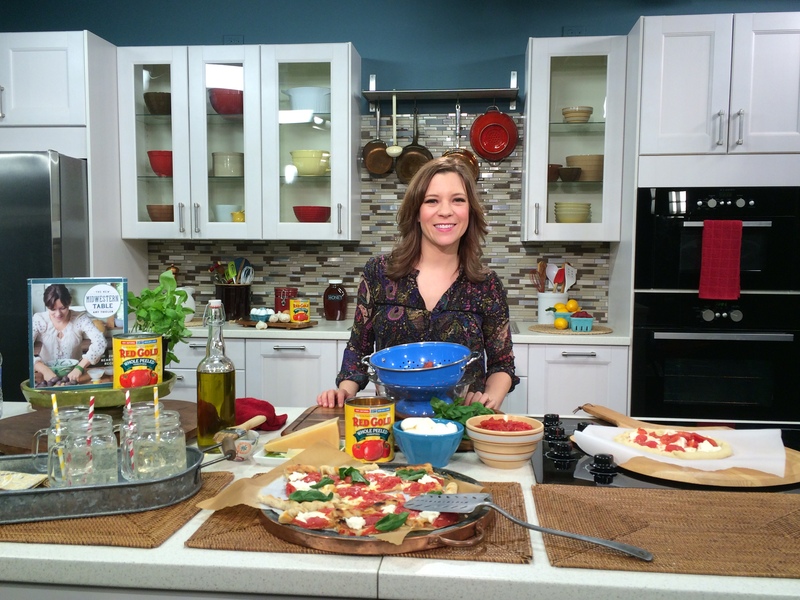 Amy Thielen: I have a couple recipes that are good for high-quality canned tomatoes. one is a Tomato Mozzarella Pie with rich custard and a lightly seasoned tomato top. Then I have a variation with a Thin Crust Pub Style midwestern kind of Pizza with a cracker crust and fresh tomato marinara. I like toss my own cracker crust dough which doesn’t even have yeast. 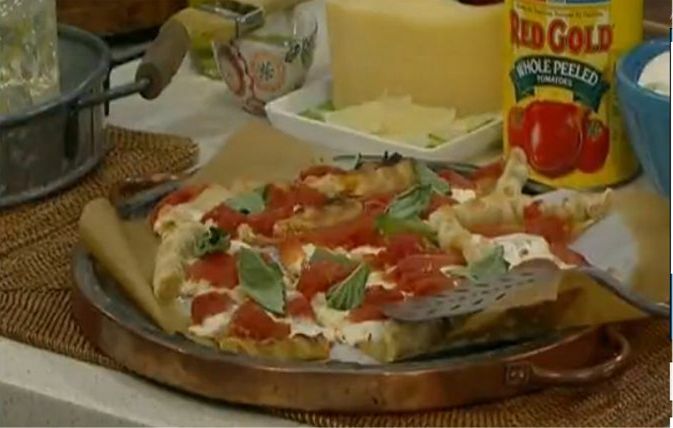 It’s very simple to make or you can use any pizza dough that you like or have on hand. First, brush the crust with olive oil, then lay down a thin blanket of fresh mozzarella, and then I tear the tomatoes and lay them right on top. Finally, I shower the pizza with parmesan cheese, salt and pepper, and pop it into a 500 degree oven for 10 minutes. It’s going to come out blistering and so fresh — who doesn’t like fresh tomato in the dead of winter? You can find some of my recipes for crusts in my cookbook, The New Midwestern Table, and you can find all these recipes on www.redgoldtomatoes.com.